Ocean Beach Farmer’s Market on Newport Avenue from 4:00 PM – 8:00 PM. La Mesa Certified Farmer’s Market on La Mesa Blvd from 3:00 PM – 7:00 PM. Little Italy Mercato on West Date Street from 8:00 AM – 2:00 PM. Hillcrest Farmers Market on Normal Street from 9:00 AM – 2:00 PM. Cardiff Seaside Market Located in Cardiff-by-the-Sea, Seaside Market carries our retail Coconut Yogurt, Sauerkraut, and Gut Shots for retail purchase. Goodonya Café – An organic café that uses our Ginger Carrot, Traditional Sauerkraut, Coconut Yogurt, and Gut Shots to craft their beautiful menu items. They also carry our retail 14 Mushroom Blend Tinctures! Healthy Creations – You can find Healthy Creations in Encinitas, where they sell our Coconut Yogurt for retail purchase and also use it as an ingredient in their inspiring café entrées. Nectarine Grove – A brand new 2018 eatery in Encinitas, Nectarine Grove specializes in healthy, nutritious, local, gluten free, and tantalizing menu items. You can find our Coconut Yogurt as an ingredient in their delectable foods, for purchase in our glass pint jars. 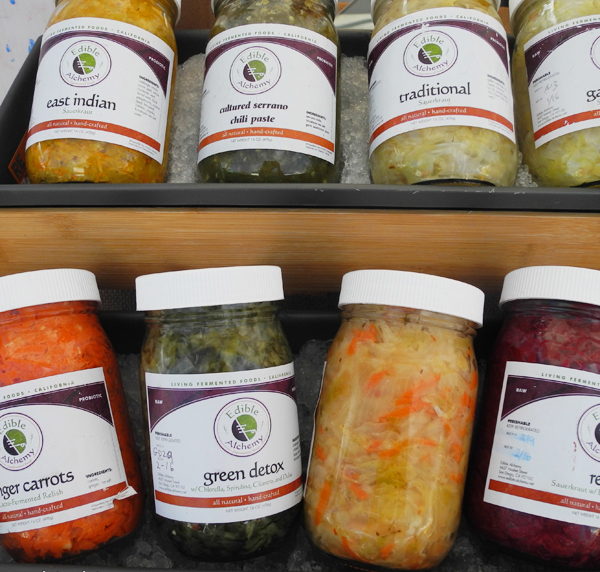 They also carry some of our scrumptious Sauerkraut glass pint jars. Frazier Farms – Both locations, Vista and Oceanside, carry our Coconut Yogurt for retail purchase. Apple Tree Supermarket – Located in beautiful Ocean Beach, Apple Tree Supermarket carries our Coconut Yogurt and our refreshing Kombucha Tea for retail purchase. Brew Coffee Spot – A café located in La Mesa that carries our Coconut Yogurt to make their incredible Coconut Yogurt Parfaits. Café 160 – A café located in Kearny Mesa that carries our Traditional Sauerkraut for their delightful entrées. Food Bowl Market – You can find Food Bowl in lovely South Park, and they carry our Coconut Yogurt, Green Detox Sauerkraut, Red Sauerkraut, Traditional Sauerkraut, and Kim Chi Sauerkraut. Fourpenny House – Located in the heart of downtown La Mesa, Fourpenny House is an eatery specializing in “bread, beer, and spirits”. You can find our Coconut Yogurt in among their rotating seasonal ingredients menu. Simply Local – Found in North park, Simply Local is an incredible store in to find locally produced products, including our Kombucha soap and Mushroom tinctures. Trilogy Sanctuary – They are located in La Jolla, and carry our Green Detox Gut Shots and Coconut Yogurt to make some of their delightful foods. Windmill Farms – An organic grocery in Del Cerro that carries oodles of our Coconut Yogurt for retail purchase. Green Door Catering – In the heart of La Jolla sits this vegan eatery that whips up glorious food decadence. Martin uses our Coconut Yogurt and Kombucha tea to help create his art. Mission Square Market – You can find this unique 100% vegan grocery from the 8 freeway off of Mission Gorge Road. We are proud to have them carry our Coconut Yogurt glass pints, Sauerkraut jars, and Kombucha tea quart jars for retail purchase. Get one of their sandwiches – they are amazing! Sprouts Farmers Market – Our delicious Coconut Yogurt can be found in abundance for retail purchase at both the Chula Vista and Eastlake independently owned locations.